Our furry boy, Rex the yellow lab, has been an absolute pistol today! A full-fledged member of the family, Rex never hesitates to let us know his thoughts and feelings. In fact, this Mom is now rather skilled at pet whispering. During the weekdays, Rex treats me to "the look", filled with a mixture of irritation and impatience, while his Mom is unable to take him for his previously customary morning walks. I will readily admit that I am nearly as impatient as he, to resume our regular routine, now into my sixth month of restricted mobility due to a recent foot injury and surgery. Although I am able to assuage his self concern with petting and indoor play, our boy loves and needs to stretch his legs. Exhibiting as much restraint as he can muster, he allow my husband the whole of approximately fifteen minutes after arriving home from work before his woeful pleas begin. "Dad!" "Dad!" "It's walk time, Dad!" I know the whole conversation by heart because this Mom is his translator. He barks; I interpret. In fact, if Dad seems to be particularly hard of hearing, in between the pleading parts of our joint conversation, Rex turns to look at me, as if to inquire about my interpreting skills, concerned I might not be relaying his message precisely when Dad doesn't hop to putting on his walking shoes. In truth, I am beginning to wonder if he really needs an interpreter as I am convinced this furry boy can spell. Despite Dad and my efforts at stealth, Rex certainly knows the meaning of "W-A-L-K" and "P-A-R-K" and even "B-U-T-T-E-R". Rex has been in rare form (read: trouble) this week, sorely missing his weekly trip to run and swim at the dog park as this past rain free weekend found the Hubs busy in our yard, playing catch up from the loss of prior weekend work due to weather. Add to Rex's frustration the temptation of the uncovered pool in our backyard, still in the process of chemical balance and not yet open for pups. True to typical frustration manner, Rex was caught red-pawed, as he swiped things about the house, from clothing to books to even a cell phone. Although we don't miss trips to the dog park without compelling reason, we can appreciate Rex's need for exercise. 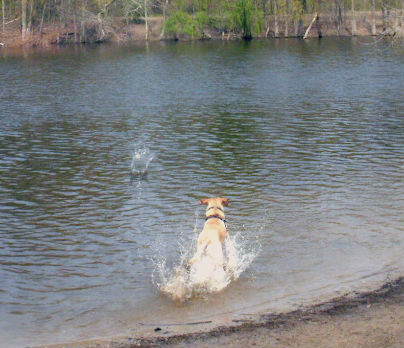 This inherent quality found in Labradors, along with their love of water and friendly demeanor were important factors in choosing a breed for our family dog. Long daily walks and hikes with the family helps Rex to fit right in with the rest of his two-legged family members. Even so, there are days when he is in rare form that cause me to appreciate his four-legged feline sister more so than usual. Today has certainly been one of those days. Calm, cool, regal and reserved, the feline representative in our family is, in so many ways, the antithesis of Rex. Preferring quiet to raucous, private play rather than family outings, she is selective in wanting attention, rather than permanently in mode for bounding about. Certainly worth mentioning, she has the good grace to not drool! Easy to get along with and much less demanding, still playful but not at all inclined to accompany us on a walk, our beauty brings her own style of contribution to the family. Despite their differences, there are surprising similarities in the two of them, our pets and their ability to coexist after a rocky introduction is nothing short of miraculous. After three years together, they have developed an easy, if not close, relationship of sorts. I frequently catch them napping in the morning sun of the living room, calm and relaxed, stretched out within inches of each other. Rex keeps close track of her location, welcoming the responsibility of announcing her desire to come back into the house from our enclosed back porch. In return, she allows him a brief sniff, although doesn't hesitate to put him in his place if he exceeds her tolerance. Before adding a new pet to your home, I strongly recommend research. You'll want to consider the full scope of your commitment. The average life expectancy of indoor cats is 12-18 years and 8-14 years for dogs. Taking into account typical cat behavior and dog behavior by breed will further help you make the perfect selection for your family. Work schedule, frequency of travel and activity level of your family should be matched to the type and breed of animal you choose. Certain breeds are more tolerant of young children but even the most patient of animals will still need your protection from young, curious hands of children who will need to learn proper ways to interact with pets. Although it can be heart wrenching to pass up an opportunity to adopt a kitten, puppy or even an older pet in need, taking the time to be sure of your choice will ensure a long, happy relationship for both you and your new pet. I'm just not a cat person. Although they are much simpler to care for and probably better suited for my life - I was not happy getting up at 5 am this morning when everyone was whining to go out - I just prefer more of the companionship I get from my dogs. I love our cats although they do take more of a commitment than people realize. While Rio the dog has a cute little personality, the cats all have unique and funny personalities. There are a few cats that have etched themselves into my heart but as a rule I'm not a cat person. I'm a bird person. LOL We have had dogs in the past but won't be getting any more. Sorry that it posted anonymous as I thought I had my name typed in to the one above. This one was mine. here are a few cats that have etched themselves into my heart but as a rule I'm not a cat person. I'm a bird person. LOL We have had dogs in the past but won't be getting any more. Funny...my dog can spell O-U-T and my son tries to say OUTSIDE in weird accents to see if the dog knows what he is saying. Smart little critters! I'm not a pet person because of allergies.